Most if not all of us have experiences some form of acne at some form in our lives. Especially at some embarrassing point in our lives. Although often seen as a rite of passage in teens, acne can stubbornly resist treatment for some and last into their 20's, 40's and even 50's for some women. Especially once a month. And there are so many people who had clear skin in thier youth who are dealing with acne on a day to day basis now as adult-onset acne. ME!!!! ME!!!! I never had acne as a teenager only this hormonal acne as it is the end. This book, The Complete Acne Health & Diet Guide: Naturally Clear Skin Without Antibiotics, includes over 150 recipes to help keep your skin clear from the body outward to cleanse your body from the inside out and help rid your body of toxins that would cause these to be so heavy. 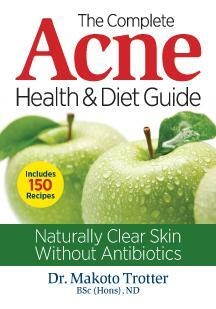 It introduces a diet plan that eliminates inflammatory foods while adding low-glycemic, anti-acne super foods. All of the meals are manageable and provide a balance of the major food groups. Foods containing sugar ar highly inflammatory, and avoiding sugar is the cornerstone of the diet. In addition is is the best to eliminate either foods the may be linked to acne. including dairy, gluten, eggs, processed food, artificial ingredients, alcohol and coffee. The book also provides information on the anatomy and physiology of acne how to deal with scarring, topical treatments and much more. Dr. Makoto Trotter Bsc (Hons), ND is a licensed naturopathic doctor with a special interest in digestion, hormones and skin conditions. He has specialized in these areas for over a decade and is passionate about holistic medicine. He lives in Toronto, Canada. This is a big book to go through. It is very large and discusses so much about acne and I am very happy about that. I have specialized in acne since I became an Esthetician. This book is divided into parts. The first part is Understanding Acne. That means discussing the various types of acne lesions, why do you get acne and does diet play a key role in getting acne. Some doctors are on the fence with whether diet plays a role. The next section is Managing Acne. Treatments, Natural Skincare, Dietary Triggers, Normalizing the Hormones, Stress Management and Acne and Hormones. Finally, the third section is The Vibrant Skin Diet Plan. How to to live this plan and have clear beautiful skin as well as the recipes involved. It is very interesting to think that sticking to one whole diet could actually be a skincare plan. I could not test the plan because it involves eating red meat and I don't eat red meat. It upsets my digestion. It's a 4 week meal plan. It does have vegetarian options too but still this is an excessive plan that I cannot do because I cannot cook anymore. I do like that the recipes are more than just a few little ingredients listed next to something organic. These are real recipes tested out on a person who has graciously allowed her to look and feel her best by testing out the recipes. This diet works with your body to create an internal state that is less inflamed and more balanced. All of the approaches are gentle and support your whole body. As the function of your hormones, immune system and digestive system normalizes, your skin will follow suit, rewarding you with a clear, glowing complexion. Are you ready to try dieting for a beautiful skin cleanse diet that will leave your complexion looking amazing!?!?!? Just try out this acne diet and follow it for a month.